Pro Variable Speed features a 10 speed variable dial as well as a powerful pulse up to 24,000 RPMs! This expansive speed range offers everything from gentle blending to total crushing to Nutrient & Vitamin Extraction. You can easily adjust to the correct speed without worry of over mixing or processing. PRO Variable Speed – Ninja’s expansive speed range offers everything from gentle blending to Total Crushing to Nutrient & Vitamin Extraction*. You can easily adjust to the correct speed without worry of over mixing or processing. This precision blending is backed by our 2.5 peak horsepower motor. * Extract a drink containing vitamins and nutrients from fruits and vegetables. Dual Stage Blending – Only from Ninja! Ninja has Total Crushing Blades that rotate at 5,000 RPM at freeload that CRUSH whole fruits, vegetables, seeds & ice. The bottom High Speed Cyclonic Blades rotate independently at 24,000 RPM at freeload to liquefy ingredients into a silky smooth consistency in a matter of seconds. Power – The Ninja Ultima blender is equipped with a 1500 Watt / 2.5 Peak Horsepower Motor to power through the toughest ingredients. The combination of blade speed and power is the ultimate tool that allows you to create chef inspired recipes at home. 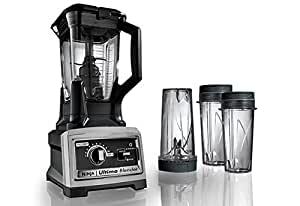 Versatility – The Ninja Ultima blender offers more versatility than a traditional blender due to the power, speed and Dual Stage Blending technology. You can create endless recipes from nutrient-rich juices to dips to purees & so much more. Ninja Ultima blender offers accessories and attachments for even more versatility!